The Otard family traces its origins back to the middle of the 9th century to a Norwegian Viking named Ottar. Otard Cognac house, also known as Chateau de Cognac, was founded in 1795. This little Chateau was also the birthplace of King Francois 1 of France. The royal Chateau of Cognac was bought by Baron Otard in 1795 for its unique ageing conditions. Situated on the same level as the river Charente, the relative humidity reaches 90%. The walls are 3 meters thick enabling the temperature to remain constant at 15°C throughout the year. The eaux-de-vie used for this blend come from the Grande Champagne, Petite Champagne, Borderies and Fins Bois. Age is unclear, but based on its flavour profile at least an average of 8 years old. 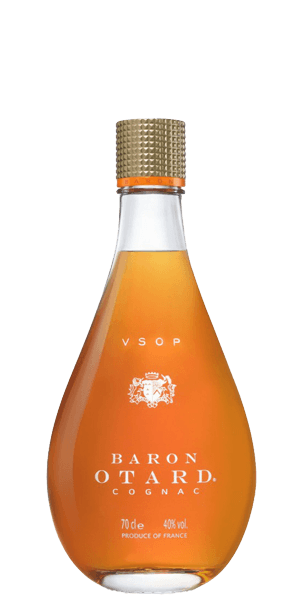 What does Baron Otard VSOP taste like? The Flavor Spiral™ shows the most common flavors that you'll taste in Baron Otard VSOP and gives you a chance to have a taste of it before actually tasting it. Deep gold with hints of red copper. A strong nose floral aromas, green fruit (pear), linden trees, oak, tobacco and a hint of vanilla. Round, with vanilla and earthy tobacco note, tannins from oak and apricots. Finish A good length for a VSOP. A nice length for a VSOP. As an after-dinner drink, serve it neat at room temperature. I like the tobbaco here and then firther complexity. Cognacs are normally not my first choice, but this one has a great earthy/oaky, slightly smokey flavor to it - if you like peaty scotches and are trying to branch into cognacs, this is an excellent choice. Hints of fruit, slightly with a delicate balance. Very nice sipping cognac. This is the second cognac that I have tried. Very similar to the Merlet. I think I need to try on its own, not at a tasting. This is really, really good. Lots of vanilla up front. I have been drinking a lot of port wine lately and this reminds me a bit of that experience - this is great finish to a night of dining. Light but with a slight bite and that wonderful warming feeling that you expect. Fine taste. Going to be a regular in the cabinet! Was very surprised with this dram. Smooth with a great sweetness. Great choice wth a cigar. Smooth taste and a hint of fruity sweetness.